Luofu Mountain, one of the 10 most famous mountains of China, is situated to the northwest of Boluo County, Guangdong Province. The mountain is actually part of a range of 432 peaks, and with over 900 waterfalls, 18 caves, and 72 cliffs. To Daoists, the mountain is known as the Grotto Heaven of Vermillion Brightness and Shining Perfection. Luofu Shan (shan means mountain) is best known as the place where the renowned Daoist Ge Hong (281-341 A.D.) once refined elixirs. During Ge Hong's stay on Mt. Luofu, four huts were built, and subsequently enlarged into temples, namely: the southern Temple of Emptiness, the western Temple of the Yellow Dragon (known for medical healing traditions and kung fu; its gate pictured below), the eastern Temple of the Nine Heavens, and the northern Temple of Junkets. Daoism on Mt. 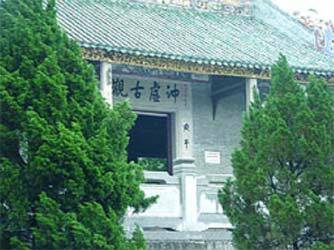 Luofu remained prosperous until the Qing Dynasty. After the Ming and Qing Dynasties, many of the mountain's temples collapsed and only five major ones remain nowadays: the four mentioned above plus the Temple of the White Crane. The Grotto of Vermillion Brightness on the mountain is said to be the place where Ge Hong cultivated Dao and attained immortality. 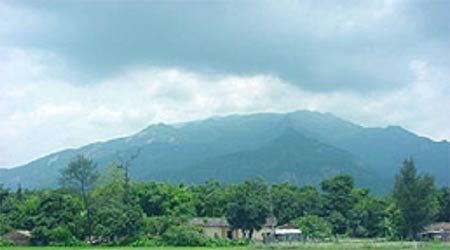 It is situated in the forest in the deep valley below Mt. Luofu, where everything is in deep stillness, except for gurgling streams. This refined and quiet place is just like a fairyland. 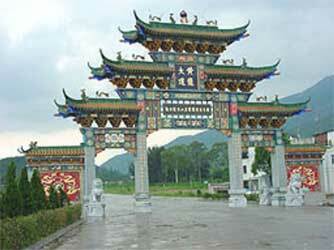 The gate to the western Temple of the Yellow Dragon in Luofu mountain. Luofu Mountain seen from a nearby village. 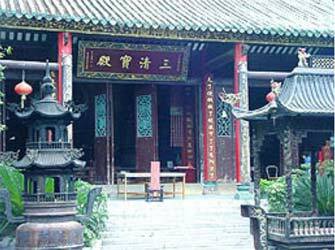 The Chongxu Taoist Temple, one of the most impressive places on Mt. 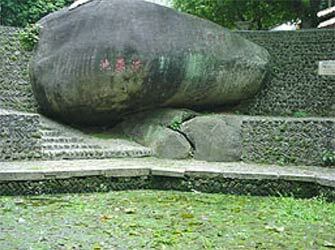 Luofu, was first built in 330 A.D. by Ge Hong. He had waived his high official position and a considerable salary to retire to Mt. Luofu with his wife Bao Gu, an acupuncturist. The couple often climbed up the mountain to pick herbs to cure the diseases of the local people. They researched folk remedies extensively. Ge Hong built himself an elixir oven in an attempt to produce life-extending pills, called Nine-Turn Golden Pills. According to legend, for forty-nine days he took the pills himself, and ascended to heaven as an immortal. His clothes turned into tens of thousands of butterflies, which now gather around the present Butterfly Cave. In the Sanqing Hall of the temple are statues of Ge Hong and his wife. A lake called the White Lotus Lake is in front of the temple, with its impressive "Immortal's Gathering Place Bridge" spanning the water. There are many other relics of Ge Hong on Mt. 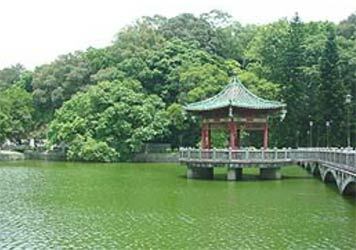 Luofu, such as the "Well of Longevity" from which he obtained water, the alchemical kitchen for refining elixirs with its special oven, and the pond for washing medicinal herbs. There are two famous herbal medicine products of Mt. 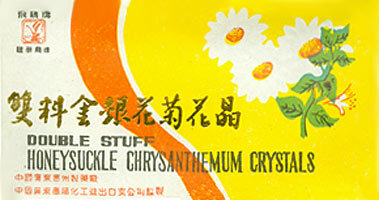 Luofu, one is an herbal oil, and the other a combination of honeysuckle flowers and chrysanthemum flowers. The latter, Luofu Shan brand "Double Stuff" is made with the herb extracts on sugar crystals for making an instant tea, with 10 packets per box. It is a detoxicant formulation, meant to cleanse the blood of all kinds of toxins. This cleansing action helps prevent and treat many diseases; the herbs were selected because they also promote long life and have a tonic effect. Typical use is 1 packet each time, twice daily. The ancient Chinese doctor Ge Hong. The pond for washing medicinal herbs on Mt. 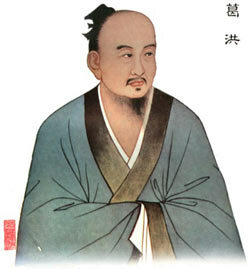 Luofu.